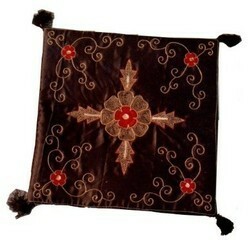 United Exports is manufacturer of Cushion Covers. The company established since 2013 and located in India. Pamper yourself, because this is what you deserve, with our extravagant jacquard cushion cover collection. The unique jacquard weave is bound to raise eyebrows while our numerous color combinations can be matched with any home decor. These easy to wash, easy to maintain jacquard cushion covers are best way to compliment yourself. Our company has created a niche in the field of offering Satin Cushion Cover. We are offering an alluring range of supreme quality Satin Cushion Cover to our clients. The cushion covers have foam backing, which is long lasting. Further, our product range also has contemporary designs embroidered in a wide collection of colors and patterns. Product Detail: Size: H 12" x W 13"